A Jack Russell/Coca-Cola yo-yo flyer from Japan promoting the Summer Olympics in Los Angeles, California, 1984. An Olympic licensed Jack Russell "Gold Medal Yo-Yo". Made of white plastic with gold chrome. A flocked "Eagle Sam" patch. You could choose from one of five colored patch versions as seen on the flyer. You were also given a chance to earn a dual yo-yo holder with two Jack Russell yo-yos. You had to collect six triangle cards at the yo-yo contest venue. How those were collected I'm not sure. 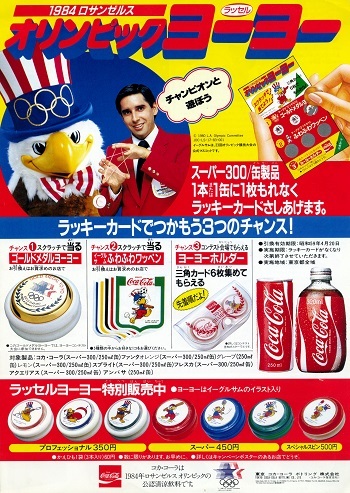 The flyer also announced the sale of special Olympic-themed Jack Russell yo-yos featuring Eagle Sam the 1984 Summer Olympic mascot. The prices list for the yo-yos are in yen. The flyer mentions for you to see the yo-yo contest poster at the front of the store where you buy Coke products. The poster listed the date and time of the yo-yo contest. The back of the flyer lists yo-yo tricks that presumably would be part of the contest along with other prizes you could win. DOWNLOAD PDF (624 KB) to see the complete flyer.